Velocity were proud sponsors of Taccert’s first Business Conference and Expo on the 29th October at the UK Centre for Carnival Arts, which was described by participants as the most successful African and Caribbean business event ever held in Luton. Deputy Lieutenant of Bedfordshire Revd. Lloyd Denny and Taccert’s Grafton Barbour welcomed participants to the event, which aimed to raise the profile of African and Caribbean businesses in Luton and Bedfordshire and inspire local entrepreneurs, with a range of speakers, including Velocity’s Business Advisor Biola Ormalade and a marketplace of businesses, such as crafts, fashion, books, travel, finance and publishing. Key note speaker Lord McKenzie of Luton gave an informative perspective on Brexit, discussing the impact and opportunities for business growth in Europe and helping businesses to know their position. Michael Olatunde from Rapid Business Finance talked about alternative sources of finance when bank loans are not available and James Houston, from the Nigerian-British Chamber of Commerce spoke about business opportunities in Africa and how in his role as the Chairperson is facilitating partnership developments. A central theme of the event was raising the profile of African and Caribbean fashion designers, so Ronke Ademiluy, Founder of International Africa Fashion Week held in Nigeria, spoke about her work in establishing a social enterprise to create jobs for local people in the fashion industry in both the UK and Nigeria. She discussed the origins of the Africa Fashion Week, giving a profile of African designers and talking about competition within the fashion world alongside the likes of London Fashion week. A fashion show also formed part of the Expo, demonstrating the unique aspects of African Fashion and promoting local designers. Professor Elizabeth Anionwu, Founder of the Mary Seacole Trust, spoke about using her professional background to become a self-published writer, even inspiring some participants to try their hand at writing. In her first book ‘Mix Blessing from a Cambridge Union,’ Elizabeth shares her experience of being raised in a children’s home and writes about being a mixed race child in the 1950s. There was excellent feedback from participants and exhibitors, who really welcomed the opportunity to network. 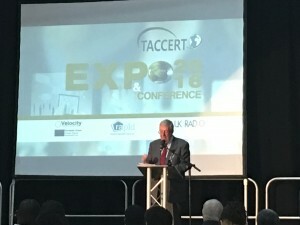 Taccert aims to make the conference and business expo an annual event. The African and Caribbean Community Regeneration Trust (TACCERT) is a social enterprise which was set up to support the African and Caribbean business community in Luton and surrounding areas, stimulating business growth and trade and helping these businesses to participate effectively in the local economy through networking, advice and partnership opportunities.